Perkele´s Blog: Still pretty low on stock removal. I like curved edges on chopping tools and that one looks like good chopper. I want to try that out on some day! Well,i do like the knives of Uruk-Hai´s too. I am afraid that you wont be trying this one, unless you loan it from the new owner ;). I like that blade!!! Looks a bit like that Sylvester Stallone insult to tribal knifemaking in the "John Rambo" movie, and like a beast of a chopper, too! 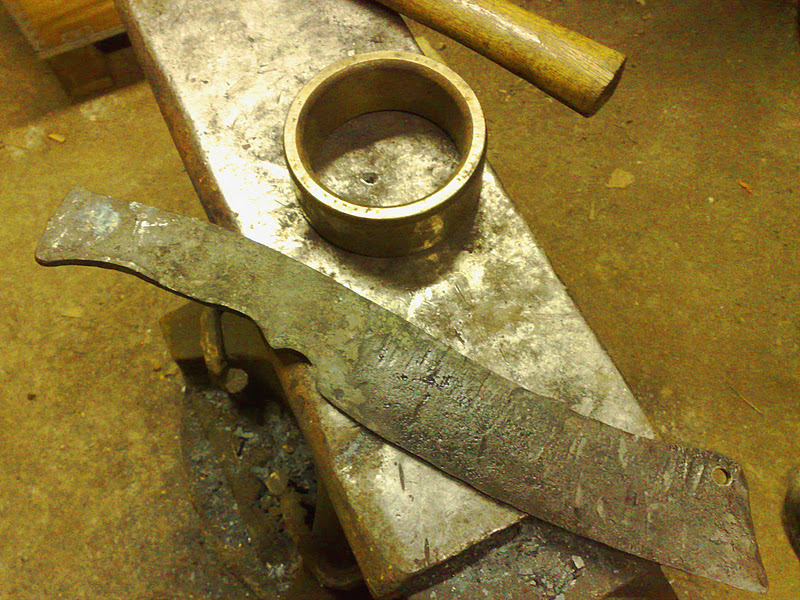 If you want to spare yourself ANY stock removal, try making a hollow full - metal tang / handle. Drive the hind part out with the hammer´s peen and wrap it close to tubular shape. Then all you have to do is do a wrapping. Works like a cinch on beater knives! Well the Rambo 4 knife is the Only Rambo knife that makes any sense to me, Fimbulmyrk :). 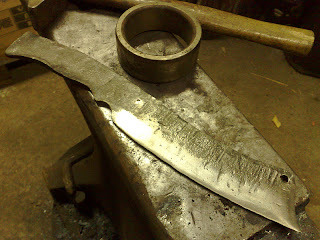 Yes, i have been forging a lot over many years but Now, when i got to use the one smith shop as my own, i can make just about anything, When i want and as long as i want to beat the steel,as long as theres coal.